경주 계림로 보검(慶州 鷄林路 寶劍)은 경주 황남동에 있는 미추왕릉 지구에서 발견된 길이 36㎝의 칼이다. 1973년 계림로 공사 때 노출된 유물의 하나로, 철제 칼집과 칼은 썩어 없어져 버리고 금으로 된 장식만이 남아 있다. 시신의 허리 부분에서 발견되었는데, 자루의 끝부분이 골무형으로 되어 있고 가운데 붉은 마노를 박았다. 칼집에 해당되는 부분 위쪽에 납작한 판에는 태극무늬 같은 둥근무늬를 넣었다. 삼국시대의 무덤에서 출토되는 고리자루칼(환두대도)과 그 형태와 문양이 다른데, 이러한 형태의 단검은 유럽에서 중동지방에 걸쳐 발견될 뿐 동양에서는 발견되는 일이 없어, 동·서양 문화교류의 한 단면을 알 수 있는 중요한 자료이다. 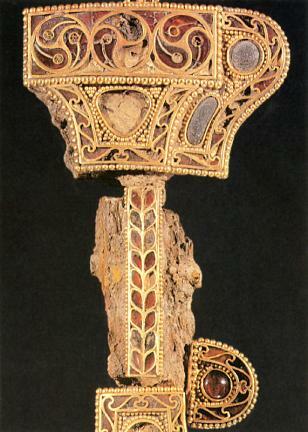 This sword was excavated from Tumulus No. 14 of the Tomb of King Michu in Gyeongju. This rare discovery is 36 cm long. It was excavated from one of the 200 tumuli around the tomb found during repair work at Gyerim-no in 1973. 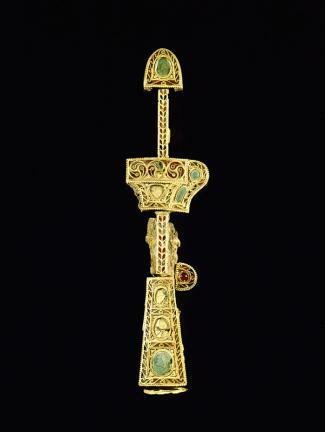 The iron scabbard and the blade are decayed and lost, and only the gold inlay remains today. It was discovered around the waist of the buried man. The pommel is shaped like a thimble and there is a red agate studded in the middle. There is a round figure that looks like the circle of Yin and Yang on the flat plate just above where the scabbard would have been. It has a different shape and pattern from the gilt-bronze swords with phoenix-topped round pommels excavated from the tumuli of the Three Kingdoms period. Such short swords are found in Europe and the Middle East but hardly ever in Asia. This makes the discovery of the sword a matter of unique importance. It is an invaluable material that shows one aspect of the cultural exchanges between east and est. King Michu was the thirteenth king of Silla. He acceded to the throne in 262 and reigned for 23 years until 284. His tomb is otherwise called Jukjangneung (Tomb of Bamboo Soldiers) or Jukhyeonneung (Tomb where Bamboo Soldiers Appeared). Samguk sagi or The History of the Three Kingdoms tells about the legendary origin of this name. In 297 (the 14th year of his son, King Yuri’s reign), Iseogoguk (a nearby confederation of tribes) invaded Geumseong, the capital of Silla. Soldiers of the Silla kingdom went out to meet their enemy but could not fend them off. At the critical moment a host of soldiers appeared. Their numbers were countless and all of them had bamboo leaves stuck behind their ears. They fought together with the soldiers of Silla, defeated the enemy, and then disappeared. Afterwards somebody noticed a heap of bamboo leaves on the tomb of King Michu and this led people to say that the dead Michu had helped Silla with his secret army.